The Regional Municipality (Fort McMurray), Alberta is a small city of 100,000 people. It is renowned for its oilsands, a supply of oil embedded in sand that surfaces in this area. There are open pit and insitu mines harvesting the oil. There is controversary surrounding the oilsands. There is water and air pollution, water consumption, and environmental effects. Some of the oil gets eventually made into plastic. And plastic bags. It's also a community that is attempting to become greener. The City Council has made a commitment to reduce waste in the city by 50% within the next couple of years. Sean Graham at age 16 saw an NFB film with his Social Studies class on the damage caused by disposable bags. His Social Studies teacher then said, "What are you going to do about it?" He and his classmates decided to start a petition to stop businesses from giving out single-use bags. Sean collected 2250 signatures of local people supporting the ban. After two years of presenting the signatures and information to city council, helping the council vote in favour of the ban, Sean finally got to see the ban come into effect. On September 1, 2010 we became the city in North America with the most complete ban on single-use bags, including paper, plastic and other materials in all stores except pharmacies, liquor stores and restaurants. Vendors are only permitted now to sell or distribute reusable bags. 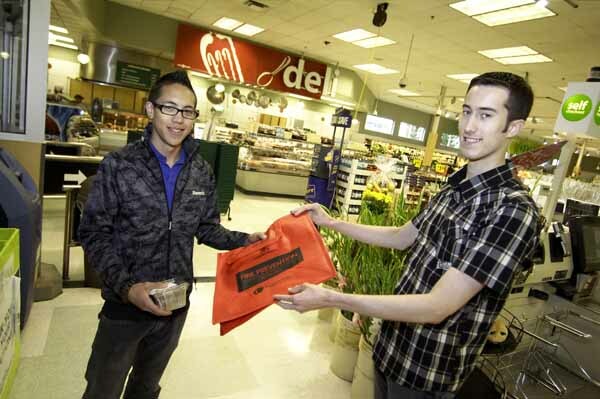 On that long awaited day, Sean handed out reusable bags in several different grocery stores. He paused for an hour in the afternoon to talk with Ecole Dickinsfield students about how they can make a difference. He spent several hours being interviewed by major newspapers.